Further liveblogging from the World Library and Information (IFLA) Conference taking place in Cape Town. Helle Mortensen (IFLA Library Services to People with Special Needs, Denmark) talked on Literacy Matters! The literacy and reading needs of people with special needs. A paper is already online at http://library.ifla.org/1231/1/099-moretensen-en.pdf. 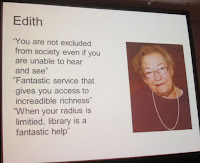 Mortensen talked about the work of the People With Special Needs IFLA section, which includes meeting the needs of those who cannot visit the library. Literacy matters because it is crucial for education and participation. Those with special needs have particular literacy and reading needs. Firstly, easy to read publications - appropriate to different age groups, and taking account of those with intellectual disabilities, dyslexia etc. (there are IFLA guidelines for easy to read materials). There also have to be alternative ways of reading: this involves a lot of reading tools and devices. The next thing that Mortensen mentioned were materials for raising memories e.g. memory boxes: again there are IFLA guidelines for library services to those with dementia. Techniques included guided shared reading, which could be used with homeless people, those with dementia etc. Some librarians in Denmark have been trained as reading guides. It was important that library staff were unprejudiced and were aware of the different kinds of reading needs. Mortensen emphasised that these needs were diverse. 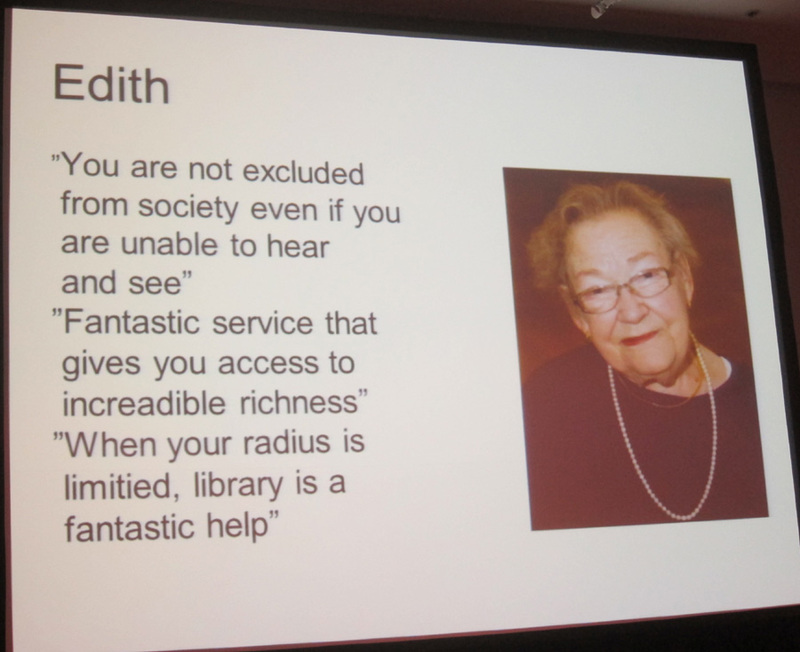 It was important to have a physically accessible library, with an inviting space and presentation, with outreach for those who cannot visit the library. The speaker recommended partnering with appropriate organisations, and also employing those with special needs.